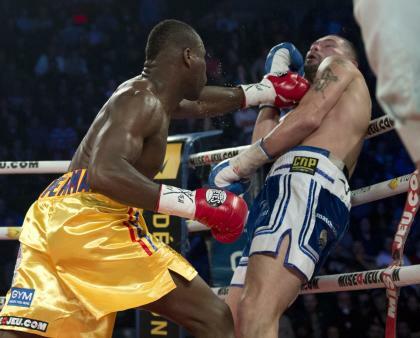 What does Adonis Stevenson have to gain from facing a lesser opponent? There weren't a lot of boxing fans who were clamoring for Adonis Stevenson to defend his WBC light heavyweight title against Andrzej Fonfara. Excluding the Fonfara household, the list would be about, oh, six or seven deep, and all of those stood to make money off the bout. Despite its seeming lack of interest or appeal, the fight will occur on Saturday at the Bell Centre in Montreal and will mark Stevenson's debut on Showtime. Montreal has become one of the boxing hotbeds of North America, and it says a lot about the match that promoter Yvon Michel is expecting the Bell Centre to be at less than 40 percent of capacity. "The capacity at Bell Centre is 22,000, and we expect between 7,000 and 8,000," Michel said. "We have used a reduced configuration, like in some of the previous fights that we have done. This is what we expected, because we are in the middle of the Stanley Cup [playoffs], and Montreal is a hockey town. There is a huge hockey fever at this time, so, considering that, this is a very, very good sale." Boxing fans would have been thrilled to see Stevenson in the ring against Sergey Kovalev, a match that HBO was desperately trying to make but bungled in the end. You can be sure if Stevenson had signed and was facing Kovalev on Saturday at the Bell Centre, there would be far more than 8,000 in the building, Stanley Cup fever or not. A group of fans would also have been content to see Stevenson match up against ageless wonder Bernard Hopkins. Instead, he appears to have chosen the path of least resistance and signed to face Fonfara. Showtime Sports executive vice president Stephen Espinoza passionately defended Fonfara and insisted that he'll make a competitive fight with the man known as "Superman." "Andrzej is not someone to look past," Espinoza said. "He's a very good puncher. He's a very good boxer. I think his boxing skills are very underrated. I believe this main event, Stevenson-Fonfara, is going to be a much tougher fight than many of you may think. I said it about [Lucas] Matthysse and [John] Molina a couple of weeks ago and I was proven right there. I said it about [Floyd] Mayweather and [Marcos] Maidana and I was proven right there. "I expect a very competitive, tough fight." Fonfara may rise up and surprise people, but there is a reason that Stevenson is a better than 10-1 favorite. But what the long odds have done is put the pressure squarely on Stevenson to deliver a noteworthy performance. If he's lackluster in victory, it's going to seriously hurt his cause. Stevenson mocked Kovalev and insisted he's in no way ducking him. But Stevenson-Kovalev was shaping up to be one of the most anticipated bouts of 2014, and Stevenson opted to skip it in favor of an opponent who is a plus-800 underdog at many sports books. "I don't care if people talk, because I have proven already that I'll fight anybody anywhere," said Stevenson, one of boxing's best power punchers who is 23-1 with 20 knockouts. "Who is Kovalev? Why would I duck him? He's only fought B fighters. I fought A fighters. I fought Chad Dawson. "I'm not afraid of Kovalev. He's overrated, man. Frankenstein Kovalev is very overrated. I'd knock him out fast. Easy work, man." Stevenson said he was willing to face Kovalev, but said the fight didn't happen because his adviser, Al Haymon, wasn't happy with the deal he was offered. It's now the source of a lawsuit filed by Main Events against Stevenson, Haymon, Michel, Golden Boy Promotions and GYM, Michel's promotional company. That will be settled by lawyers when the sides come to a settlement, because it's highly unlikely that Haymon will submit to a deposition by Main Events attorney Patrick English. But if in the event the suit isn't settled, it's for a judge or a jury to decide later which side is correct. Stevenson has more immediate concerns, though, like burnishing his reputation. Fairly or not, he took the brunt of the heat for refusing to face Kovalev and now, he's in a position where he must not only win but look good while doing it to regain the public's trust and interest. A big knockout would go a long way toward making fans forget about the lost opportunity with the Kovalev fight. Stevenson, a disciple of the legendary late Hall of Famer Emanuel Steward, has plenty of power and the mindset to swing for the fences. "The one thing I learned working with Emanuel for the time I did is that knockouts sell," Stevenson said. "People want to see the knockout. When Mike Tyson was fighting, people were always interested because you knew someone was going to get knocked out. It was always exciting. "I love knockouts and I'm training for the KO. I want to be the new Mike Tyson, the light heavyweight Mike Tyson, and I'm going to go out there and try to show that."